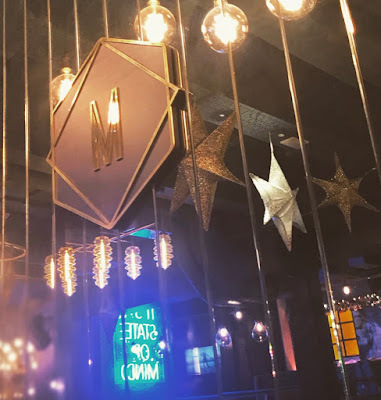 I recently won a competition to visit the brand new bar and restaurant, Manahatta. I never win anything so this was such a nice surprise - particularly as it was somewhere I really wanted to go! 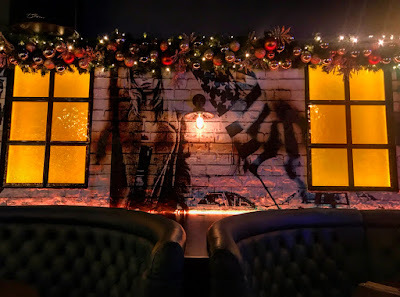 Manahatta, located in the centre of Manchester nightlife, is a New York style eatery and bar featuring contemporary decor and an American themed menu. 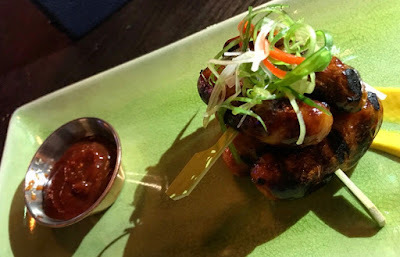 Opened in November, Manahatta has quickly become one of Manchester's most popular hot spots. I couldn't wait to visit on Wednesday and took my friend along with me! I'm not a massive one for spicy food, or starters particularly, but David loved these. Served with mustard and chipotle ketchup, these mini sausages can be served either plain or spicy. If you like spicy food I'd definitely go for the spicy option though to add an extra kick of flavour. Double beef burger, shredded iceberg, burger sauce, American cheese. For some reason, I was really craving a burger so a burger was what I opted for! I'm the kind of person who always gets food envy; I always end up wanting what everyone else has ordered rather than my own!! Does anyone else get that or is it just me?! The burger came plain but there was the option to add American Cheese or Pancetta (or both) at an extra cost. I opted for just cheese - you can't beat a cheeseburger! I do wish I'd gone for something more adventurous because there were some amazing dishes on the menu but all in all, I did enjoy my burger. Thomas Jefferson’s famous dish of macaroni in a stringy cheesy sauce, baked & topped with breadcrumbs & served with smoked pancetta. My friend opted for the Mac & Cheese. Firstly, can we just admire the presentation of this dish?! I loved that it came in a small pan as it added something a little extra than just serving the food on a plate. The side of pancetta ham was also the perfect addition to the meal, adding an extra flavour. Mac & Cheese is one of my favourite ever dishes, particularly in winter. I think it is such a comfort meal. I will definitely be visiting again to try this! Malteasers, chocolate ice cream, white chocolate sauce, squirty cream, white chocolate flakes, smarties, popping candy, milk chocolate sauce. Wow. I have no words. This dessert was everything and more. I love anything chocolatey so it was an obvious choice for me! The waffle was really light and airy so it wasn't too heavy after a big meal. 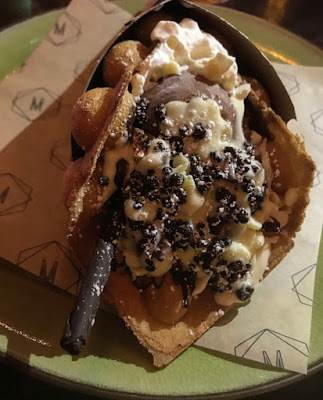 I also loved how the waffle didn't become soggy when mixed with the ice cream and sauces; it kept its structure and taste well. I will admit, I didn't taste any popping candy but the waffle was amazing without. I would definitely recommend this dessert to anyone visiting! We were offered two complimentary cocktails as well as the two course meal. I opted for the French Connection whilst David chose the Negroni. The French Connection - consisting of Grey Goose vodka, Manahatta cordial, Yuzu sake, lime and soda - was extremely refreshing. The lime provided quite a strong, nice flavour and I really enjoyed it. It was also really pretty which, of course, is what you want from a cocktail! I love the graffiti style brick walls, with classic American colours and the flag. The Christmas wreaths were lovely and made me feel really festive. I also love the Manahatta mirrors, scattered around the restaurant. I also love the bulb like lighting. The combination of both brings a very light and open feel to the place. I had a lovely time visiting Manahatta - thank you for having me! I would definitely recommend a visit, even just for a cocktail (or two)!